Hi friends! I'm BAAAACCCCCKKKK! Guess why?! Well, I accidentally overbooked by giveaways by one. Next, I got offered one more giveaway. Then, one thing lead to another and I'm doing two giveaways a day. What can you do? I love to give and I love my readers! Our next giveaway is funded by me. I bought these items and I will ship them to the winner. Unravel is a very important organization to me. It was founded by my friend Libby Kranz to spread awareness and raise funding for pediatric cancer in honor of her daughter Jennifer (JLK) who passed away from a brain tumor. If you read my blog during September, you'll know that this year we joined in their Fluttering Campaign which raised $158,000. And this was only the first year. Libby inspires me everyday because her heart knows no bounds. She can achieve so much and she will keep her promise to JLK that she would help other kids with cancer. 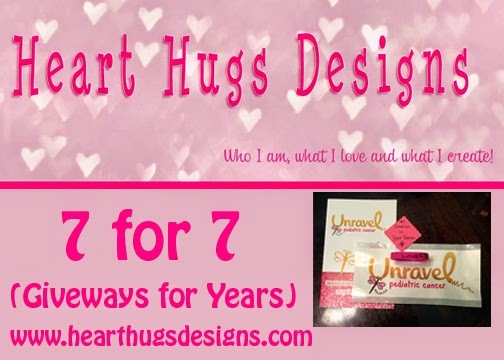 The prize pack includes 1 Unravel Bumper Sticker, 1 Unravel Bracelet, 1 Unravel Brochure, and a $5 donation to Unravel made in your name. Huge thank you to the Unravel office crew who went out of their way while they are still building their store to find these items and sell them to me! You guys rock!!! Love all you did to help raise $$ and awareness for Pediatric Cancer!! Same here! I really enjoyed watching your Flutter progress via Facebook, you rock!